Blazing a trail straight out of the black metal stronghold of Martins Ferry, Ohio, comes Necrotherion; a four piece who deliver some truly caustic musical savagery. Now, whilst I may well joke about the black metal output of their hometown, I am not joking about the musical content that this band have delivered on this album. After the synthesized intro of the self-titled Necrotherion, the album plunges headlong into the majestically raw guitar frenzy of Lamb of Decadence. This is the type of music that will leave scars on those that listen to it; it’s technically very good, but still retains an earthy and primitive feel to it. Accompanying the sonic devilry are haunting choral passages, that further add to the atmosphere of the track. 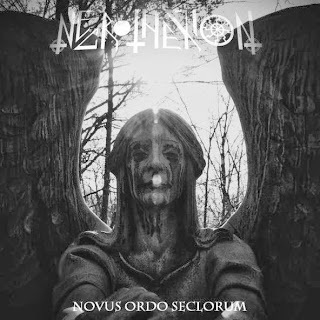 It’s a theme that runs throughout the 7 tracks contained on Novus Ordo Seclorum, an album that definitely harks back to the old school feel of black metal, yet also manages to feel as though Necrotherion are very much bringing their own satanic panic to this aural church burning. On a personal level, I thought that the album’s pinnacle is the title track itself, a song which gallops along with an almost Maiden-esque feel to it, albeit one with a heightened intensity to it. At the end of the day, Novus Ordo Seclorum is a damned fine album and one that has had many plays on the decks of doom. 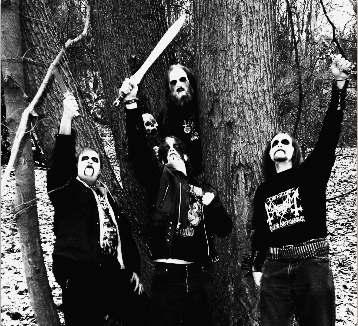 It’s raw, evil sounding black metal that manages to encompass both the old and new, and delivers in all departments. Definitely worth your while checking out when it gets a release in early 2014. Novus Ordo Seclorum is due for release in early 2014. For more information check out Necrotherion's Facebook page.